Properties are nothing but the variable with getter and setters, by Default kotlin provide the getter and setter for kotlin variables, So all the Kotlin variable are Properties. In below example, name and age are variable, we should initialize these variables as they are non-nullable dataTypes. I have declared them as var, so that we can change values. If I declare as Val then we cannot change the values of them. var name:String = "chercher tech"
Lets assign some value to the variables/properties in kotlin. Setters are used to set the value of the variables, only var variable has setter as we cannot change the value of val variable in kotlin. Kotlin Compiler calls these getters and setters internally whenever you access or modify a property using the dot(.) operator on the class object. Let's see the compiled code of the above program. Please do adjust with below image size. To see decompiled code in your system, Navigate to Tools->Kotlin->Show Kotlin Byte Code and the select deCompile option but you might see the java code In above image you can see that getter and setter are only to help with getting and setting the value, but if we create our own getters and setters then we can write the code according to our needs. val name: String = "chercher tech"
The major purpose of the getters and setter is get and set the value of a variable	. You might have noticed two identifiers in all the getter and setter methods - field and value. Lets talk about then now. We use value as the name of the setter parameter. This is the standard convention in Kotlin but you are free to use any other name if you want. value identifier will be having the value that we are trying to assign to the variable. Backing field helps you refer to the property inside the getter and setter methods. This is required because if you use the property directly inside the getter or setter then you’ll run into a recursive call which will generate a StackOverflowError. A property with a custom getter can never be a compile-time constant. Kotlin does not support evaluating code at compile time. 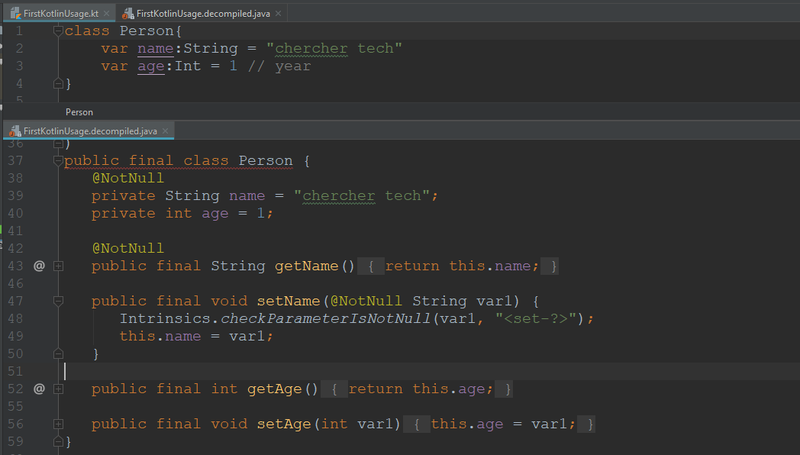 const val age: String= "12"
In Kotlin, when you define variable either we have to initialize with some value or define them in such way value can be null for those variables. In some cases, you want to initialize the value later but don't want the variables to have the null value. Sometimes variable are assigned with lazy Initialization, when you want that variable to get execute only once. Lazy Initialization accepts a lambda and the lambda will be executed only once, when you call the variable again the lazy initialization will not be executed again but you will get the previous result. Basically his results in singleton pattern kind of thing. For example, you have 10 page in your application, each one of the page requires a database connection, and also you have a logic and get the details of the database everyday for a per day token( so that you cannot store them in const as the token changes every day). In this you might want to run the code to generate the token and use for the day, so do you think it is better to calculate that token (returns same token). 10 or 100 times, would thing to store the resut of first time execution in some place then use it for remaining times. With lazy initialization you can achieve this. In kotlin, you must initialize non-null variable while declaring, if you do not then compiler will show error for it. But sometimes, you might do not want to initialize the variable, but you may want to initialize the variable, only before using it. You should use the lateInit in case if you do not want to initialize a variable in while declaring. Delegates.Observable makes sure that when a value changes of a particular variable, it can perform some actions like notifies you or it performs some changes. To use Delegates Observable you need to import a package from the kotlin language. Basically it is something like a listener, it listens to the variable that we have declared with Delegates Observable. You can provide the initial value for the Variable in Observable method as argument, Delegates Observable works with a lambda with three parameters, kotlin handles those parameters.